REAL LIVING CHRISTMAS TREE - Can be placed outside in the garden after Christmas and can be used repeatedly, eliminating the need to keep buying new trees. STUNNING DUAL-TONE FOLIAGE - This tree is best known for showcasing two different coloured needles, the drooping branches feature a delightful dark green on top with a striking steely-blue underneath. CARE GUIDE SUPPLIED WITH EVERY ORDER - Keep your tree in top condition with our free step-by-step care guide. This gives tips on prepping, watering and decorating your tree. The Serbian Spruce is another variety that is fast gaining popularity in the UK, with its slow-growing form and slim trunk, many people see it as the perfect ornamental Christmas tree. The dense bushy foliage of this tree features 2 different colours, with a wonderful darker green appearing more prominently on the top, and a silvery-blue showing at the bottom. With it's drooping branches, it provides quite an effect that looks even better when decorated. The Serbian Spruce also gives off a prominent fresh forest scent and has no problem retaining it's needles when provided with regular care. Caring for this tree doesn't require much effort, it really only needs water to keep it going, although this will be required often. Make sure when watering that the soil is not waterlogged, and do not allow the container to dry out. 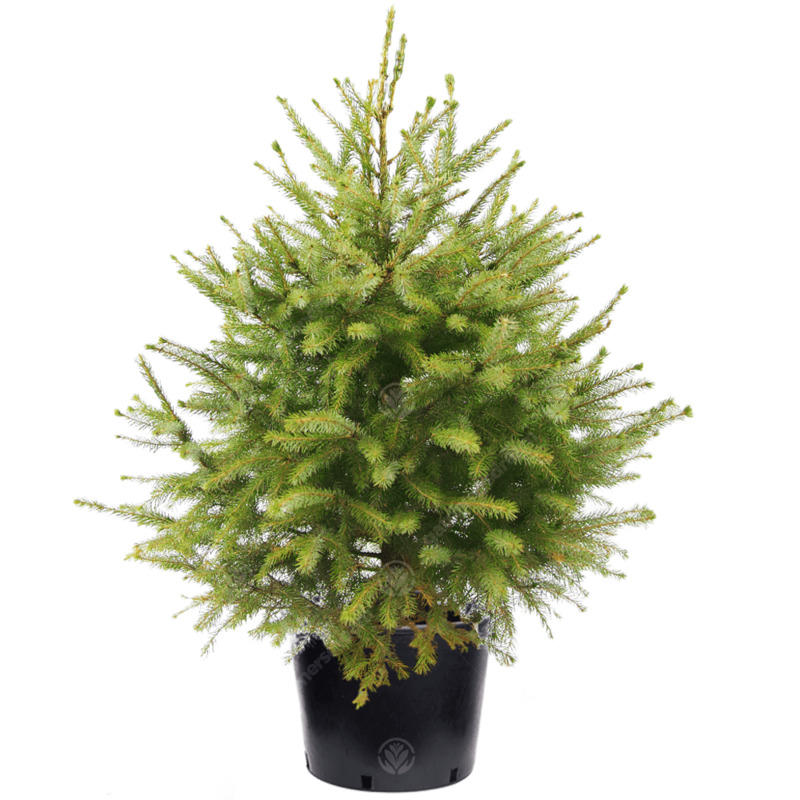 Once the Christmas period is over, you can transfer the tree into your garden, you can leave it in the container it is supplied in but we recommend you re-pot the tree into a larger pot to accommodate its growth. The root system that develops within the pot will allow this tree to live for years provided it is given the right level of care. Keep it outside as close to Christmas as possible, and when it is time to bring the tree inside, keep it away from sources of heat such as radiators or fireplaces, these will dry the tree out and quickly cause it to drop its needles. As we ship these staple Trees directly to you from our premises this guarantees the life and quality of the tree you will receive as you know it won't be bashed around in travel. It's going from us to you! Can I reuse this Tree after the seasonal period? Absolutely! These pot grown Trees are intended to stay with you for years to come. Just make sure you don't cut the tree and keep it in an appropriate pot size (the one you'll get with it will absolutely do you for the first year). Being a well-established Gardening supplier you will expect we care about the environment, real trees absorb carbon dioxide from the air during their growing period and of course help the environment around you. Coming into your room with a live Christmas tree in the morning also gets you into the Christmas spirit every day with it's beautiful scent and appearance that cannot be matched by artificial. How wide will my tree be? Real Christmas trees can vary as of course they are real live trees! We tend to go with a rule that the width is around 1/2 of the height of the tree. Sometimes 1/3 for the ones who enjoyed a good growth period. The taller the trees are usually nearer 1/3.